Comic Strip Master Command sent a nice little flood of comics this week, probably to make sure that I transitioned from the A To Z project to normal activity without feeling too lost. I’m going to cut the strips not quite in half because I’m always delighted when I can make a post that’s just a single day’s mathematically-themed comics. Last Sunday, the 24th of September, was such a busy day. I’m cheating a little on what counts as noteworthy enough to talk about here. But people like comic strips, and good on them for liking them. 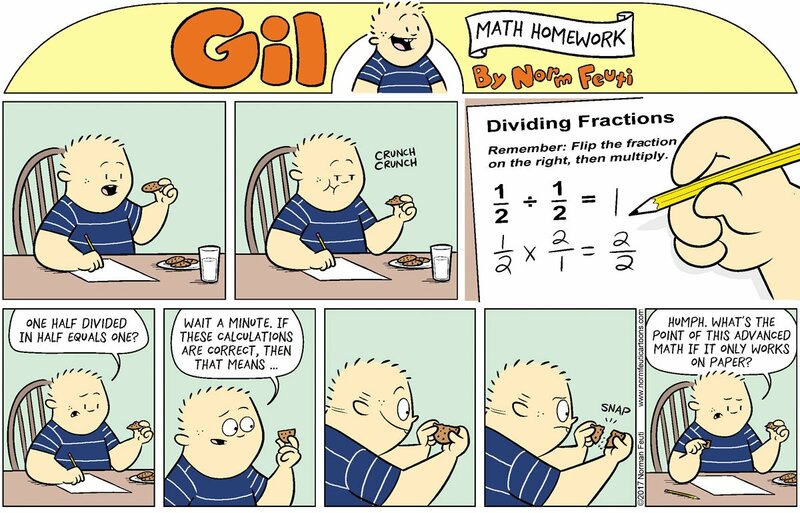 Norm Feuti’s Gil for the 24th sees Gil discover and try to apply some higher mathematics. There’s probably a good discussion about what we mean by division to explain why Gil’s experiment didn’t pan out. I would pin it down to eliding the difference between “dividing in half” and “dividing by a half”, which is a hard one. Terms that seem almost alike but mean such different things are probably the hardest part of mathematics. Norm Feuti’s Gil for the 24th of September, 2017, didn’t appear on Gocomics.com or Comics Kingdom, my usual haunts for these comics. But I started reading the strip when it was on Comics Kingdom, and keep reading its reruns. Feuti has continued the comic strip on his own web site, and posts it on Twitter. So it’s quite easy to pick the strip back up, if you have a Twitter account or can read RSS from it. I assume you can read RSS from it. Russell Myers’s Broom Hilda looks like my padding. But the last panel of the middle row gets my eye. The squirrels talk about how on the equinox night and day “can never be of identical length, due to the angular size of the sun and atmospheric refraction”. This is true enough for the equinox. While any spot on the Earth might see twelve hours facing the sun and twelve hours facing away, the fact the sun isn’t a point, and that the atmosphere carries light around to the “dark” side of the planet, means daylight lasts a little longer than night. Ah, but. This gets my mathematical modelling interest going. Because it is true that, at least away from the equator, there’s times of year that day is way shorter than night. And there’s times of year that day is way longer than night. Shouldn’t there be some time in the middle when day is exactly equal to night? There’s a flaw here and I leave that to classroom discussions to work out. I’m also surprised to learn that my onetime colleague Dr Helmer Aslaksen’s grand page of mathematical astronomy and calendar essays doesn’t seem to have anything about length of day calculations. But go read that anyway; you’re sure to find something fascinating. 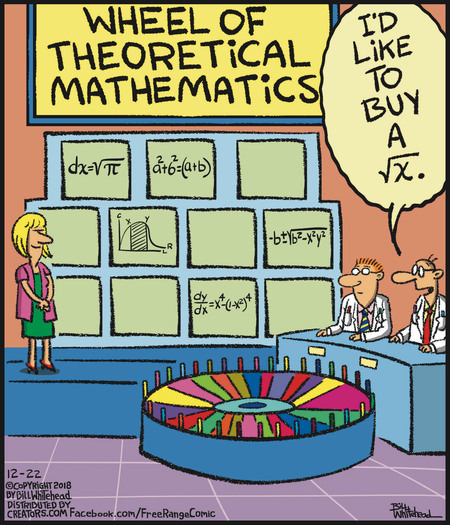 Bill Amend’s FoxTrot, and its representation of “math hipsters”. I hate to encourage Jason or Marcus in being deliberately difficult. But there are arguments to make for avoiding digital calculators in favor of old-fashioned — let’s call them analog — calculators. One is that people understand tactile operations better, or at least sooner, than they do digital ones. The slide rule changes multiplication and division into combining or removing lengths of things, and we probably have an instinctive understanding of lengths. So this should train people into anticipating what a result is likely to be. This encourages sanity checks, verifying that an answer could plausibly be right. And since a calculation takes effort, it encourages people to think out how to arrange the calculation to require less work. This should make it less vulnerable to accidents. I suspect that many of these benefits are what you get in the ideal case, though. Slide rules, and abacuses, are no less vulnerable to accidents than anything else is. And if you are skilled enough with the abacus you have no trouble multiplying 18 by 7, you probably would not find multiplying 17 by 8 any harder, and wouldn’t notice if you mistook one for the other. Jef Mallett’s Frazz asserts that numbers are cool but the real insight is comparisons. And we can argue that comparisons are more basic than numbers. We can talk about one thing being bigger than another even if we don’t have a precise idea of numbers, or how to measure them. See every mathematics blog introducing the idea of different sizes of infinity. Bill Whitehead’s Free Range features Albert Einstein, universal symbol for really deep thinking about mathematics and physics and stuff. And even a blackboard full of equations for the title panel. 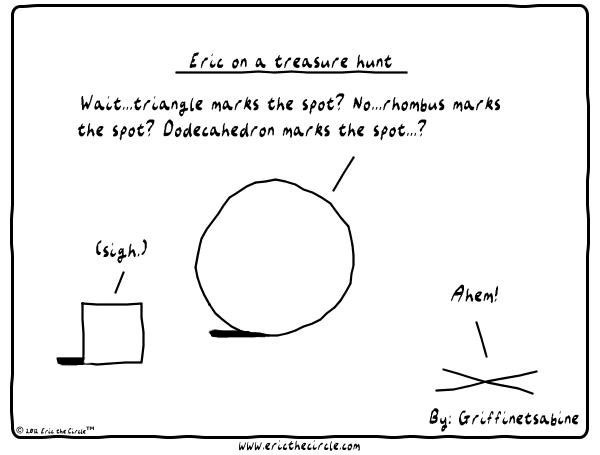 I’m not sure whether the joke is a simple absent-minded-professor joke, or whether it’s a relabelled joke about Werner Heisenberg. Absent-minded-professor jokes are not mathematical enough for me, so let me point once again to American Cornball . They’re the first subject in Christopher Miller’s encyclopedia of comic topics. So I’ll carry on as if the Werner Heisenberg joke were the one meant. Heisenberg is famous, outside World War II history, for the Uncertainty Principle. This is one of the core parts of quantum mechanics, under which there’s a limit to how precisely one can know both the position and momentum of a thing. To identify, with absolutely zero error, where something is requires losing all information about what its momentum might be, and vice-versa. You see the application of this to a traffic cop’s question about knowing how fast someone was going. This makes some neat mathematics because all the information about something is bundled up in a quantity called the Psi function. To make a measurement is to modify the Psi function by having an “operator” work on it. An operator is what we call a function that has domains and ranges of other functions. To measure both position and momentum is equivalent to working on Psi with one operator and then another. But these operators don’t commute. You get different results in measuring momentum and then position than you do measuring position and then momentum. And so we can’t know both of these with infinite precision. There are pairs of operators that do commute. They’re not necessarily ones we care about, though. Like, the total energy commutes with the square of the angular momentum. So, you know, if you need to measure with infinite precision the energy and the angular momentum of something you can do it. If you had measuring tools that were perfect. You don’t, but you could imagine having them, and in that case, good. Underlying physics wouldn’t spoil your work. Probably the panel was an absent-minded professor joke. Life as a graduate student is not exactly the way Tuesday’s Free Range, by Bill Whitehead, presents it. But meetings with one’s advisor do feel terribly close to this.